"Radharani is hari-priya, very dear to Krishna. So if we approach Krishna through the mercy of Radharani, then it becomes very easy. 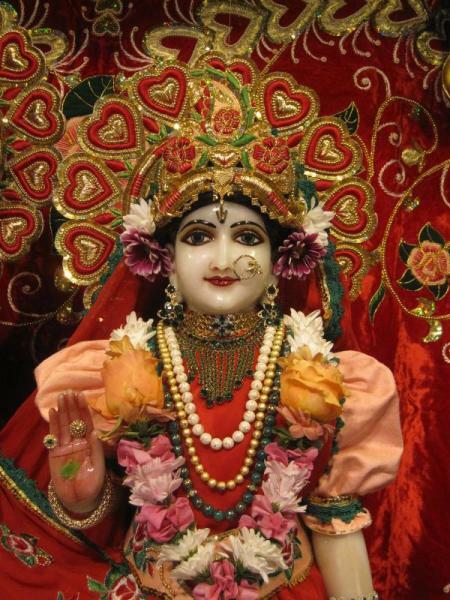 If Radharani recommends that, 'This devotee is very nice,' then Krishna immediately accepts, however foolish I may be. Because Radharani recommends it, Krishna accepts. Therefore, in Vrndavana you'll find all the devotees chanting Radharani's name more than Krishna's. Wherever you'll go, you'll find the devotees are addressing one another, 'Jaya Radhe.' They are glorifying Radharani. They're more interested in worshiping Her. This is because, however fallen I may be, if somehow or other I can please Radharani, then it is very easy for me to understand Krishna."